As indicated in earlier posts, now that outside the Adelaide metropolitan area looking for a simple means of continuing to use Excel/VBA and Acad LT as simple geographical information system(GIS). For such purpose I am not overly concerned about geographical features such as coastlines and roads. What I do need are simple rectangular map grid coordinates with which I can use simple in the plane trigonometry: no spheroidal surfaces. So whilst I can get latitude and longitude from using Google earth, I need to convert these to map grid coordinates. For one coordinate at a time the Geoscience Australia website is useful, for many points however it is a bit slow. Also in attempting to use the site it became apparent that need to ignore the negative sign for the latitude as exported from Google earth. I did find some spreadsheets which can batch convert, and thinking back, maybe they also suffer the same issue with respect to the negative values. 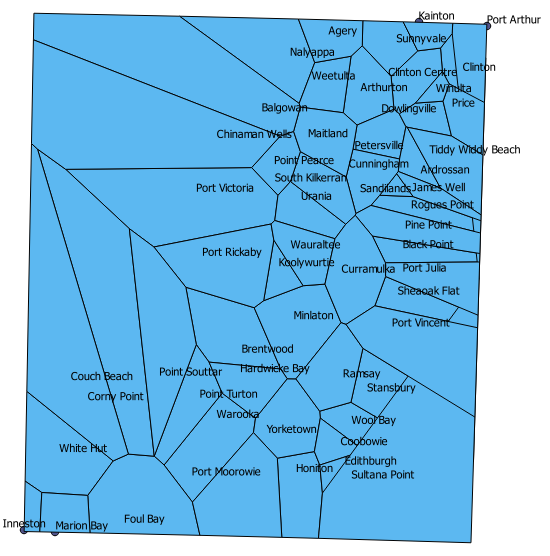 With it all seeming too complicated I opted for using Maitland to Ardrossan as a baseline, and then triangulating with Moonta. The problem with that approach however, is that whilst I can measure distances in Google earth, I cannot determine bearings. So with such approach can locate towns and features relative to a common baseline, the over all orientation would be unknown. However using the Geoscience Australia website to convert three coordinates didn’t seem too much of a hassle, so has to give the point collection a suitable bearing. Plotting these three points in Acad LT, is when it became apparent that the point collection was upside down. Still it indicated was on the right path to being able to work in 2D. And if could get QGIS to batch convert the geographical coordinates to grid, it would that more efficient, unfortunately was having problems importing the kml file from Google earth. 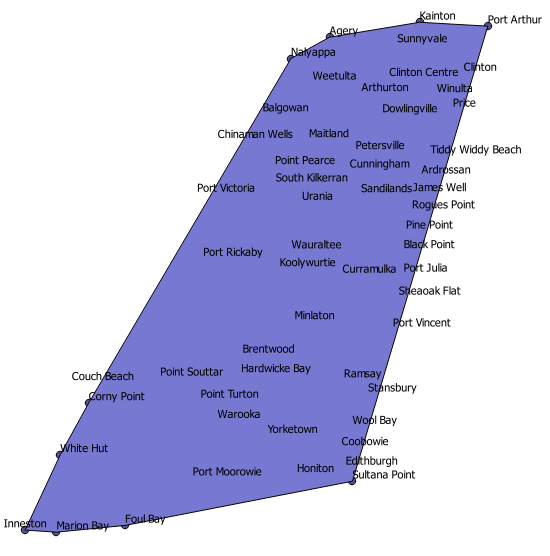 I started by getting a list of towns in the Yorke Peninsula district council area from Wikipedia, though will revise at later date by checking against the local government association website entry for Yorke Peninsula Council. Using this list built a simple kml file of placemarks, then loaded this into Google earth, which automatically geocoded them, the resulting placemarks then saved back to a kml file with the coordinates (longitude / Latitude) now available. Then renamed this file to xml, and opened in MS Excel, then copy/pasted the town names and coordinates to another MS Excel workbook. The coordiate string being broken apart by using the MS Excel text to columns command. A header row identifying the field names: name, x,y,z, was then added, this was then saved as a CSV file. Once I had a csv file, I then made use of the following guides lines: Importing Spreadsheets or CSV files from the qgistutorials website. 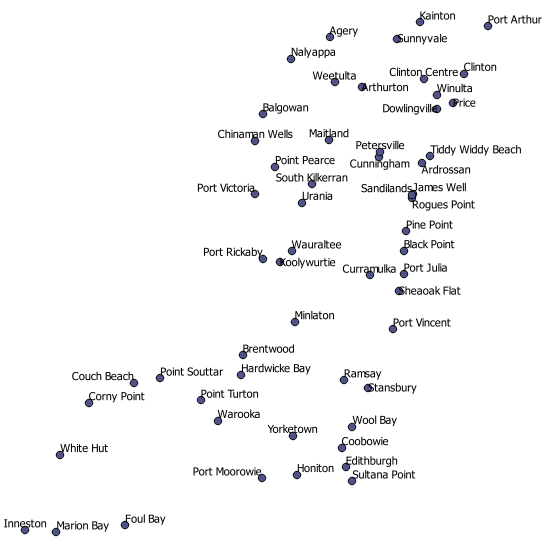 This got the point data into QGIS. If I understand correctly the problem with direct import of the kml file, is that the kml file has too much largely irrelevant data in the form of multi-geometry and linear rings. It is easier to create a csv than to simplify the kml file. Once got the data points into QGIS the next task was to export to a dxf file of another CSV file with transformed coordinates. From somewhere discovered I can right click the layer and select save as, and from the dialogue box that displays can choose AutoCAD DXF, CSV and other formats, can also select the Coordinate Reference System (CRS) to change to. From the CSV file was able to load the point data into MS Excel and plot an XY-chart, and calculated the centroid of the point cloud assuming equal weighting for each town. 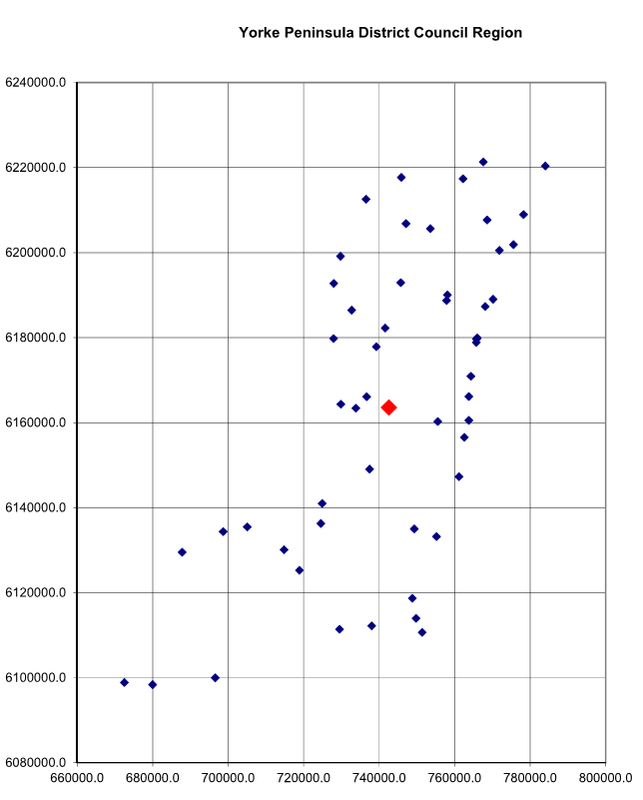 The centroid is indicated by the red dot in the following image. From the point cloud Maitland looks a lot more northern than central. Having got the data into QGIS, I tried out some of the tools. Previous attempts at using the tools resulted in errors with trying to write files, so this time round attempted to write to a folder outside my windows profile folder, and it worked. 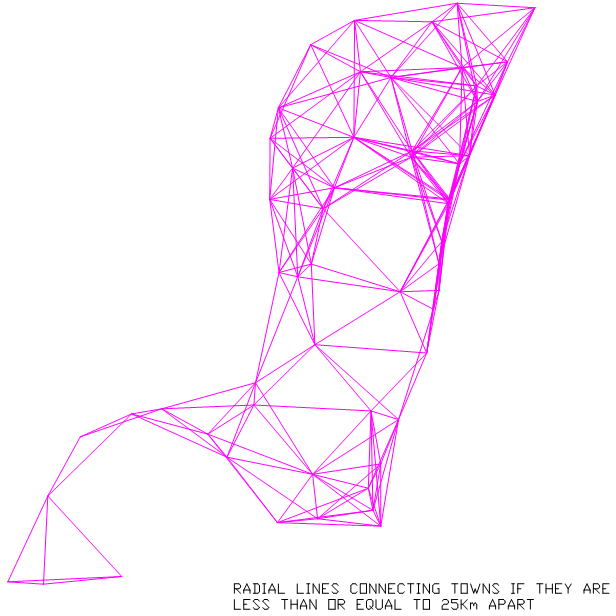 So produced convex hull, delaunay triangulation and voronoi polygons for the collection of towns. The delaunay triangulation provides one approach for finding towns close to each other, whilst the voronoi polygons are an indication of catchments areas assuming all towns are of similar rank. The diagrams require some refinement to take the coastline into consideration. An alternative approach for determining the catchment areas is to find the midpoint of the radial lines joining neighbouring towns and draw a polygon through those midpoints. People living near the boundaries, near the vertices have equal distance to travel between neighbouring towns. Those people inside the polygons, have a shorter distance to travel to the town at the centre of the polygon. People would generally only choose to travel to another town if the other town has a different rank than their nearest town. The rank is determined by the functions and/or services available from a given town. The catchment areas should only be created for towns of the same rank. For example population wise, Kadina and Yorketown are towns of similar rank, and there is little in between of similar rank: and that could be considered a problem.